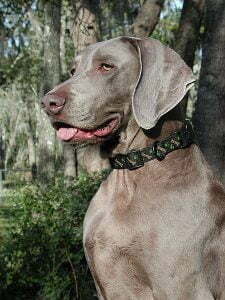 The Weimaraner (pronounced VYE-ma-rah-ner) is an athletic, working breed that was originally bred for hunting deer, boar and bears in the early 19th century. Being an all purpose gun dog, they were also used for hunting smaller animals such as rabbits, foxes and birds as the popularity of hunting larger game waned. The name derives from Karl August, the Grand Duke of Weimar, who loved to hunt. A long haired variety exists, but the gene is recessive; long haired puppies will only be produced if both parents posses it. The Weimaraner’s short, smooth coat and striking eyes give it an aristocratic appearance, setting it apart from other breeds. The colour of the coat comes in many hues, ranging from mouse grey, charcoal blue to silver grey. The breed also comes with blue or black coats, but these are to be avoided if you wish to show your dog as they will be automatically disqualified because of this. 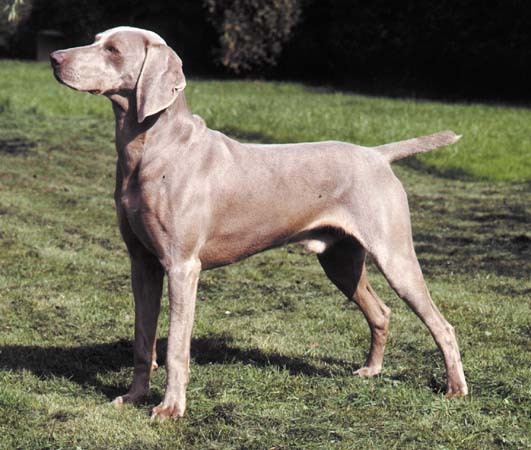 The Weimaraner may have a small white mark on the chest, or the ‘mark of the hound’ – faint tan markings similar to a Doberman. Weimaraners usually have their tails docked to 4 cm, but the tails of the long haired variety are left intact. The short haired coat of the Weimaraner is easy to keep in top condition. Groom with a firm bristled brush and dry shampoo when the need arises. Only bathe when necessary, using a mild shampoo. A rub down with a chamois leather will make the coat sparkle. The Weimaraner is an average shedder. Weimaraners are muscular dogs, but given the proper training and enough exercise, make a good family pet. They must be thoroughly socialised as a pup to prevent them being aggressive, as they can be protective towards their family, cool towards strangers and very territorial. Although the Weimaraner is intelligent and sensitive, it is a hunting dog at heart and so will chase down any small animals that stray into your garden. They will tolerate cats, but usually only if they’ve been introduced as puppies. They are very good with children, but care must be taken when they are around small children; Weimaraners are rambunctious, and can easily knock a small child over. They can sometimes be prone to separation anxiety as they were bred as family dogs, and this manifests as wailing, excessive drooling or destructive behaviour. This lessens as the dog ages, but the Weimaraner will like to lean against it’s owner when sitting or standing, and sleep as close to the owner as possible. Weimaraners can be highly strung, so appropriate training is needed to calm them down and this is best tackled when they are puppies. Younger untrained dogs, when left on their own, like to make their own fun by chewing furniture, so care must be taken to train them correctly; obedience classes will be a great help to the new Weimaraner owner. The breed has a strong ‘prey drive’ and has a desire to be alpha, but firm leadership and a short leash can diminish these instincts. Weimaraners are motivated by rewards when training, and are eager to please. They also like to bark, but this can be easily corrected. A well trained Weimaraner makes for one of the most faithful breeds of dog, and it will never leave your side. Weimaraners are working dogs, so have energy to spare. A daily long walk or jog is essential, and giving them an opportunity to run free is highly recommended. They are fine living in an apartment as they are quite inactive indoors, but the will do best with a yard or back garden in which to run around. The Orthopedic Foundation for Animals states that Weimaraners have very low rates of dysplasia. 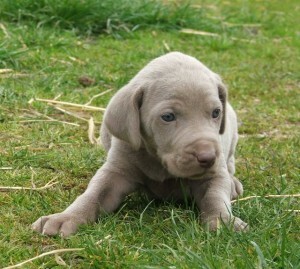 It’s advisable to buy a Weimaraner pup from breeders who have their dogs tested using PennHIP or OFA methods. Being a deep chested dog, the Weimaraner can be prone to bloating and gastric torsion. This is a serious condition which occurs when the stomach twists itself, cutting blood supply and leaving food nowhere to go. If left untreated, it can cause a rapid death. It is recommended that a Weimaraner is fed two to three times daily from a raised platform to prevent it from gobbling its food and taking in too much air into the stomach. The breed standards of modern Weimaraners were developed during the 1800s, but may go as far back as the 1200s to the court of French king Louis IX. The aim was to breed a reliable, regal looking gun dog, and it was highly prized as ownership was restricted. Unusually for the time, it lived with the family instead of being kept in packs in kennels, and this resulted in a dog which needed to be near people. It developed into an all purpose dog; it loved children, was loyal towards the family, enjoyed hunting and was a more than capable guard dog. The Germans were originally reluctant to share their Weimaraner, but during the late 19th century they started to filter through to the rest of Europe and America. Being an even tempered breed, it fast found popularity with families but this resulted in irresponsible breeding matches being made that resulted in mediocre specimens. Nowadays, Weimaraners are still popular in Britain and the United States, where more care is taken to breed quality specimens. 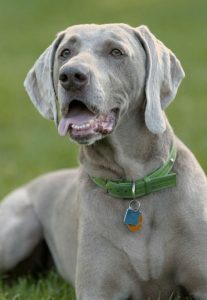 Famous owners of Weimaraners include Grace Kelly, Roy Rogers, Brad Pitt, Nine Inch Nails front man Trent Reznor, golf commentator Peter Aliss and photographer William Wegman – whose dogs Man Ray and Fay Ray appear in much of his work, including appearances in Sesame Street dressed in human clothes.